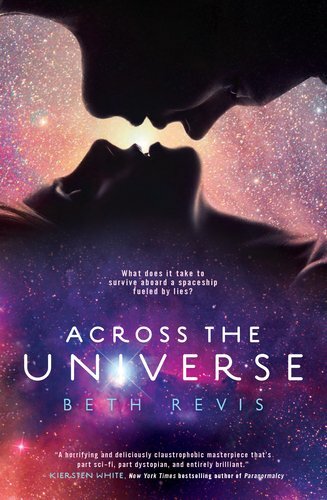 Before I started reading Across the Universe by Beth Revis I was assaulted by such praise that I was almost afraid to read the book for fear of high expectations ruining the reading experience for me. I'm not sure that I waited long enough in order to read it either, because whilst I did enjoy it, this book didn't blow me away as much as I was led to believe that it would. I think the biggest problem for me is the element of romance within the story. I didn't believe in the relationship between Amy and Eldest and I think that if I had, Across the Universe would have been so much more enjoyable. Even so, it is a pretty interesting story. Amy and her parents have agreed to be frozen in order to be amongst the first expedition to begin life on another planet. But things don't exactly go to plan, as Amy is nearly killed having been woken up 50 years too soon. It's no mistake that she was so violently disturbed, someone is out to murder her. With the help of Elder, a young man being trained in order to maximise his leadership ability in order to run the ship, Godspeed, they must solve the mystery of who has tried to kill her, before Amy's parents are the next victims. I think the inhabitants and life on the Godspeed are all a little fascinating. The dystopian world that Beth Revis created on this ship with it's different life cycles and the rules in which people follow without question was both eerie and creepy. I was suitably creeped out by some of the events that take place as well as the means of leadership employed. I'm really looking forward to seeing how the rest of the story plays out and coming back to the characters of Amy and Elder. While not blown away by this book, I'm still quite intrigued and looking forward to reading more. Oh I hate it when things don't live up to the hype, it's so disappointing isn't it. The book does sound like it has an interesting concept, I'm glad that it's left you wanting to see how the story plays out. Jenni - It is definitely an interesting book, but it was really marketed as 'love on a spaceship' and the romance bit just wasn't there for me. But without worrying about that, I really enjoyed it! I agree with Jenny I hate it when a book doesn't live up to the hype! It's great that you were honest though. I'm still intrigued by this book, so I think I will be reading it! Fab review. Liz - Oh definitely read it to see what you think of it. I think if nobody had mentioned the romance element to the story and if I'd gone into it thinking it was just an interesting YA scifi, I'd have liked it a lot more! I didn't love this book as much as other people seemed to either, but I still will probably read the sequel. I agree with the book not living up to all the hype. It was a good story, but there was definitely something missing and I hope A Million Suns is a tighter story! Angel - You and me both! I'm not ready to give up on the series, I just hope that I don't feel as disappointed with A Million Suns!